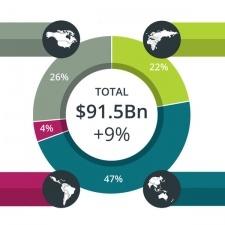 2015 will see global gaming revenues leap 9.4 percent year-over-year to $91.5 billion, according to Newzoo’s latest research. The company’s projections have not only charted by how much revenues will grow, but from where. It predicts that in 2015 the rapidly-expanding Chinese market will edge ahead of the US as the single biggest revenue contributor. While the American market will increase by 3 percent to hit $22 billion, China will jump 23 percent to bring in $22.2 billion. In total, the APAC region, including China, will account for 47 percent of the market, or $43.1 billion. Latin America, meanwhile, is the smallest of the four major markets with just $4 billion in revenues – though its 18 percent year-over-year growth also sets the region as one of the quickest. Tablets and handhelds at 13%. The tablet part of the category is growing the fastest at 27% year-on-year, but handhelds will be down 16%, reducing overall growth to 14%. In terms of combined phones and tablets market size, Newzoo predicts it will be worth $30 billion in 2015. 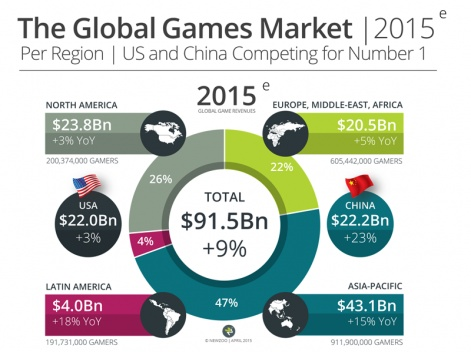 Newzoo’s 2015 Global Games Market Report will be released 6 June.